Watch Boys Varsity Division Championship games live from Ridder on our YouTube page - Click here to watch. 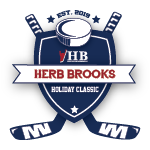 The Herb Brooks Holiday Classic is the most prestigious high school holiday hockey tournament in the state of Minnesota. It’s a hockey lover’s dream: 54 boys teams, 64 girls teams, and over 175 games played in six days! Watch the 2016 promotional video, with interviews with our 2015 two Gold Division champions -- Centennial in the girls' division and Eden Prairie in the boys'. Click here to view the video! Our 2017 champions in the Gold Divisions - Blake for the girls and St. Thomas Academy for the boys. Teams canceling their participation in the tournament before May 1 will receive a full refund; teams canceling after May 1 will not receive a refund. The tournament will follow MSHSL rules except for overtime rules. Please download our overtime procedures.